Hey, everyone! Hope December is treating you well. I’m just popping in to let you know that once again, my local indie bookstore Green Apple Books is offering signed copies of my books for the holidays! Order HERE! They’ll ship anywhere in the US for 99 cents, and just a little more international. I’ve been very quietly finishing up work on next year’s books, which has kept me busy. I do make pretty regular updates to my Instagram page, which you can follow via the Instagram app or at this link. My handle is @goraina! 2019 is going to be nuts. I’ll have information to share soon about events and my next book tour. Wishing you all a healthy and happy new year! 10:00 AM – 11:00 AM SD Central Library 330 Park Blvd Shiley Special Events Suite Why Are Libraries Important to You? This panel will feature Scholastic authors talking about their books and explaining why libraries are important to authors and readers. Featuring Raina Telgemeier, Matt Holm, and Molly Ostertag. 12:00 PM – 1:00 PM SD Public Library 330 Park Blvd Shiley Special Events Suite Handling Challenges: Bans and Challenges to Comics Comics are uniquely vulnerable to challenges and bans, especially comics for teen audiences. Learn about challenged and banned comics and what you can do if they're challenged in your school or library. (Sponsored by the CBLDF) Raina Telgemeier, Candice Mack, Gina Gagliano, David Saylor. 1:00 PM – 2:00 PM SD Public Library 330 Park Blvd Shiley Special Events Suite Read Like a Girl: Middle-Grade Fiction for Girls (and Boys) Authors and editors of middle grade graphic fiction discuss graphic novels with strong, positive female characters and the importance of overcoming the lingering perception that comics are for boys. Featuring Brigid Alverson, Nidhi Chanani, Shannon Hale, Jenni Holm, Molly Ostertag, Raina Telgemeier. 4:00-5:00 SD Convention Center Room 11 The Great Comic-Con Kids Draw-Off! Kids rule the world! And on this interactive panel, they get to be in charge! Kids will work with an epic panel of bestselling kids’ comics creators as they compete in the Draw-off to beat all Draw-offs! Bring your pencil (and your parents). Matthew Holm, Jarrett Krosoczka, Nathan Hale, Dana Simpson, Lucas Turnbloom, Victoria Jamieson, me. moderated by Tom Racine. A2CAF Ann Arbor, June 16-17! June 17 and 18 I'll be in Ann Arbor, Michigan for one of my favorite annual events: A2CAF! (Formerly known as Kids Read Comics!) It's free to attend, and I'll be at the show both days. Here's where you can find me! 11:00 am – 12:00 Noon Kickoff Event - Iron Cartoonist! 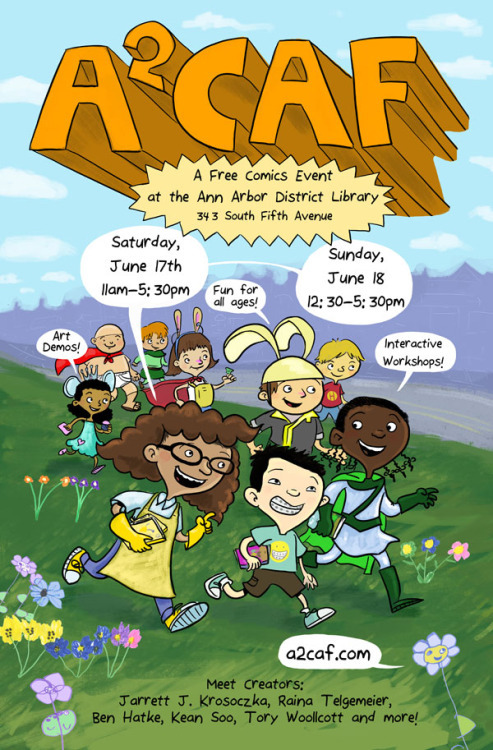 Ann Arbor Downtown Library Multi-Purpose Room Watch Ben Hatke, Raina Telgemeier, and even more of your favorite cartoonists battle it out in a series of themed drawing rounds with random elements thrown in by you! Will you help them draw toward victory, or make them squirm? Watch guest cartoonists fight for the title under the watchful eye of your host, Zack Giallongo! Your choices will help determine this year’s Iron Cartoonist! Be sure to check out the amazing slate of programming happening both days, and visit the Artist Alley -- crammed full of amazing creators! In Conversation with Faith Erin Hicks, Santa Clara CA, 4/5! Visit Books, Inc.'s event page for more info! See you there, South Bay! Yesterday was Hourly Comic Day! Where you draw a comic about every hour you're awake, from midnight to midnight. Some people post theirs as the day goes along, but I always wait until the next day to post them all. This is a weird year and a weird time. There's a lot of stressful stuff going on. And I'm still coming down from the craziness of my book tour last fall, while working on my next book! It keeps me busy, but I've also tried to make room for friends, family, and self care. I hope you're all doing the same. Below are my hourlies, typos and all. I did these without penciling or planning--just jumped right into the sketchbook with a Sharpie. Thanks to everyone who was a part of my day. Happy New Year (and Thanks)! Thank you so much to everyone who played a role in the GHOSTS TOUR!!! 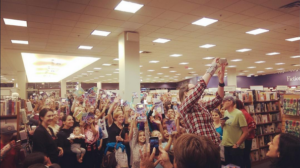 I had an unforgettable time touring the United States and Canada, meeting so many of my amazing readers! Special thanks to the bookstores, libraries, churches, nature preserves, schools, and concert halls that hosted me. And extra-special thanks to my readers -- we sold out nearly every event from Vancouver, BC to Austin TX! It was a joy to meet you all! While I'll be doing a very limited number of appearances in 2017, I am mostly on an event-break for the year as I begin work on my next book project. For info about where to find me next, check out the right-hand sidebar on my homepage! I'm still offering signed (non-personalized) copies of my books through my local indie bookseller, Green Apple Books!Order here! Saturday October 30 San Jose, CA Willow Glen Middle School 22105 Cottle Ave. San Jose, CA 95125 Hosted by Hicklebee's 2:00 PM Presentation is sold out, but you can still attend the book signing! Click for info. Tuesday November 1 Santa Cruz, CA Santa Cruz County Veteran’s Memorial Building 846 Front Street, Santa Cruz, CA 6:00pm Hosted by Bookshop Santa Cruz sold out, sorry! 11:30 AM – 12:15 PM Panel: Catching Curveballs LOCATION: CAP E1.026 Life, loss, friendship and everything in between – how do we navigate the big stuff? In their new middle grade novels, award-winning authors Paul Griffin (When Friendship Followed Me Home), John David Anderson (Mrs. Bixby’s Last Day), and Raina Telgemeier (Ghosts) show us characters who do their best, even when life throws more than a few curveballs. And that's it!!! Thanks to everyone who has helped make the launch of Ghosts so incredible, so far. I'll be back on the road again before you know it! If I’m not coming to your region but you’d still like a signed book, fear not!! My local indie bookstore, Green Apple Books, will be happy to send you a signed copy. Order here! GHOSTS TOUR: October - November! WOW!!! The first leg of the Ghosts Tour was AMAZING. I spent two weeks visiting a bunch of cities on the west coast, midwest, and midcentral east coast! For the photo hightlights, visit my Instagram! Next up, I'll be concentrating on the northeastern United States and Canada, and a few dates and details have been added to my schedule. Like before, each event has its own set of rules and regulations for tickets and information, so please see the individual websites linked to for full info. I'm afraid several events are also sold out, but I'm looking forward to seeing those of you who already got tickets! Finally, you'll see that there's still some info 'coming soon!' for my time in Texas. Please hold on, and I'll provide that info as soon as I have it!! Books of Wonder 18 W. 18th Street, New York, NY 11:00 AM Open Stock Signing -- open to the public! A panel discussion between kids creators, for kids, about the first comics that they read and wrote and drew, and how they got from reading comics to creating them, with advice for the kids. Tuesday, October 18 Mystic, CT Denison Pequtsepos Nature Center, Coogan Farm 162 Greenmanville Ave, Mystic, CT 06355 Hosted by Bank Square Books 5:00PM Sold out, sorry! Sunday, October 23 New York City Symphony Space 2537 Broadway at 95th Street, New York, NY 10025 1:00 PM Sold out, sorry! Saturday October 30 San Jose, CA Willow Glen Middle School 22105 Cottle Ave. San Jose, CA 95125 Hosted by Hicklebee's 2:00 PM Please contact store for ticket info! November 3-4: Texas events, details soon!! November 5-6 Austin, TX Texas Book Festival More details soon! And here's the animated video trailer Scholastic made!! Thank you for ALL of the enthusiasm and excitement leading up to today. I will of course be heading out on a nation-wide book tour this week, and if you'd like to purchase a signed copy of Ghosts but can't make it to one of my events, you can do so from my local independent bookstore, Green Apple Books! I've already gotten a fair amount of questions and interest in Ghosts, so to satisfy people's curiosity, I've added some content to my FAQ page. I've done some press and interviews, too, so here are links to those! There are plenty more to come! And of course, if you want to follow me on my tour, you can check out my Instagram! Oh boy...I'm gonna be a little busy this fall, visiting my readers all over North America during my GHOSTS TOUR!!! Check below to find out when I'll be in a city near YOU! Please note that with the exception of book festivals, ALL events will require the purchase of a ticket in order to attend and enter the signing lines. Links to purchase tickets are included! Each venue has its own set of rules and regulations, so please check carefully to assure you are aware of all necessary information in advance. Books will be for sale at every event, via the bookseller who is listed as the host. Check back soon for more information about the regions where I've indicated I'll be visiting but don't have full details for yet. An up to date list of events will always be available on my homepage's sidebar, over there to the right. 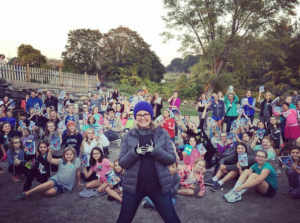 -- RAINA TELGEMEIER'S GHOSTS TOUR: FALL 2016!! Saturday, September 24 Washington, DC National Book Festival The Walter E. Washington Convention Center 801 Mt Vernon Pl NW, Washington, DC 20001 Booksigning from 4:00-5:00PM Presenting from 5:30-6:30 PM on the Main Stage INFOTickets are not required, but signings will not be available outside the times posted, and seating at the presentation will be limited to availability. Monday, September 26 Philly/Haverford, PA Children’s Book World 17 Haverford Station Road, Haverford, PA 19041 4:30 PM Signing event only. No presentation. INFO HERE. October 11-13: More Canadian events, details soon!! October 28-30: More SF Bay Area events, details soon!! November 3-8: Texas events, details soon!! 3:00pm-4:00pm We Need Diverse Comics Room 9 Nidhi Chanani (Pashmina), Ben Hatke (Mighty Jack), Nilah Magruder (M.F.K. ), Raina Telgemeier (Ghosts), and Ron Wimberly (Prince of Cats) discuss the current state of diversity in the comics industry; what’s changed over the past decade, and what changes still need to happen. 11:00am-12:00pm Author Autographing Session Autographing Area 21 Ru Xu, Raina Telgemeier Free GHOSTS ARC with book purchase while supplies last! 12:30pm-1:30pm You Can be the Next Scholastic Graphix Artist Room: 24ABC Find out how to get published by Scholastic, the #1 graphic novel publisher for children! What does it take to be published by Scholastic’s Graphix imprint? Join Graphix editors David Saylor, Cassandra Pelham, and Adam Rau alongside authors Jeff Smith, Raina Telgemeier, and Ru Xu to find out how. And stay tuned for a special announcement! 4:00pm-5:00pm Behind the Curtain: Creating Heroes in all Formats Room: 25ABC From secret hero societies to mystery-solving kids, graphic novels prove a picture’s worth a thousand words. Join artists Kate Beaton, Raina Telgemeier, Dustin Nyugen, Derek Fridolfs, Mike Wu, Greg Grunberg and Lucas Turnbloom as they discuss the creation of their new work. 5:30pm-6:30pm Author Autographing Session Autographing Area 20 Free GHOSTS ARC with book purchase while supplies last!! 1:00pm-2:00pm Author Autographing Session Autographing Area 21 Free GHOSTS ARC with book purchase while supplies last! 12:00pm-1:00pm How (And Why) Kids Started Reading Comics Again Room 25ABC How (and why) did comics and graphic novels for kids go from a sliver of the market to dominating the sales charts? And what's next for the category? New York Times bestselling cartoonist Raina Telgemeier (Drama, Sisters) and children's librarian Eva Volin are joined by comic industry insiders Gina Gagliano (marketing manager, First Second Books), Adam Staffaroni (senior editor, ROAR Comics), and Sarah Gaydos (editor, IDW) to discuss their theories. Moderated by Josh Elder (executive director, Reading With Pictures). 1:00pm-2:00pm YA? Why Not? The Importance of Teen and Young Adult Comics Room: 24ABC Once the fastest growing genres in literature, YA books have grown beyond babysitting and first loves. BOOM! Studios senior editor Sierra Hahn and creators Hope Larson (Goldie Vance,Compass South), Raina Telgemeier (Smile, Drama), Cecil Castellucci(Shade, The Changing Girl, Moving Target: Princess Leia) and Brenden Fletcher (Gotham Academy) discuss the significance of these emerging categories of comics and what they mean for modern literacy. Raina Telgemeier & Gene Yang: San Francisco, 5/7! Emerald City Comicon, Seattle, WA! 11:15AM-12:15PM My First Year in Comics Panel Room T302 You've gotten your first job in comics but now what? Join up-and-coming creators Tini Howard (Magdalena), Jorge Corona (Feathers), Jody Houser (Faith), Megan Levens (Buffy the Vampire Slayer), Raina Telgemeier (Smile; Sisters; Drama), and Phillip Sevy (Tomb Raider) as they discuss what they've done to go from “Brand New” to “Working Consistently” in the Comics industry. Beyond breaking in, the focus of this panel is to discuss different strategies for getting your SECOND job in comics - and then third, and fourth, and so on. Breaking in is only the first step. Come learn about how to take your second. 11:15AM-12:15PM YA, Why Not? Panel Room T302 Once the fastest growing genre in literature, YA books have grown beyond babysitting and first loves. Now that graphic novels are making award-winning shortlists, comics aimed at middle grade and young adult readers are growing in popularity. Join BOOM! Studios senior editor Sierra Hahn and authors Raina Telgemier (Smile), Faith Erin Hicks (The Adventures of Superhero Girl, Friends with Boys), Hope Larson and Brittney Williams (Goldie Vance), Liz Prince (Tomboy: A Graphic Novel) and Royden Lepp (Rust) in a discussion on the significance of these emerging categories of comics and what that means for modern literacy. 12:00Noon-1:00PM Spotlight on Raina Telgemeier Room W611 Come hang out with me at my spotlight panel! I'll be talking about my work, showing old photos and artwork from my early days, doing a live reading and some drawing on stage! PERHAPS there will also be a little sneak peak at my upcoming graphic novel, Ghosts!! Signing: 4:45-5:30, Author Signing Area Books will be available for purchase via Mysterious Galaxy. SUNDAY 3/27 Comedy in Comics 11:30—12:30 Room 152 This panel will include Kyle Baker, Ming Doyle, Francesco Francavilla, Agnes Garbowska, Joe Quinones, and Raina Telgemeier. Signing: 1:00-1:45, Author Signing Area Books will be available for purchase via Mysterious Galaxy. Every year on February 1, I participate in Hourly Comic Day! Cartoonists all over the world draw a comic about the previous hour of their day, for every hour they're awake. This is my seventh year doing it, and it's fun to see how things evolve over the years. This year reflects some of the big changes in my life since last February 1. And because Smile came out on February 2, 2010, this day is always my chance to look back on the ways my career has grown and shifted and taken on a life of its own over time. As always, I'm grateful to all of my readers for sticking with me! As we speak, I'm in the final weeks of production on Ghosts, and once that's off to press I'll be turning my focus back to writing for a few months, before embarking on the GhostsTour later this fall. As always, my events calendar is on the right-hand side of my website's homepage, so keep your eyes on that to find out when I'll be visiting a town near you. Thanks to my friends who were part of my day today in ways big and small. Let's all do it again sometime. It's hard to believe, but as of today, the fourth graphic novel adaptation of the Baby-sitters Club series, Claudia and Mean Janine, which was first published in 2008, is in stores in full color! This marks the end of my series that launched my career, and set the stage for me to publish Smile. It has been really fun seeing people discover my older work for the first time! As a special treat to celebrate book 4's release, I dug up something very cool from my mom's storage space: Some old BSC art I drew when I was ten years old! Check this out. Proof positive that I've been a BSC fan from the early days. I guess that made me a good candidate to adapt the series into comics almost 20 years later! If you're wondering where Stacey is, according to the page of notes I also found, this was drawn during the part of the series where Stacey moved back to New York City for a little while. Mallory and Jessi had just joined the club, too. So this was in continuity! I'd also like to note that Claudia and Mean Janine ended up being my favorite book out of the four BSC graphic novels I drew. I had the best time drawing the kids running around Stacey's yard, chasing dogs and freaking out Jenny Prezzioso. The scene where Kristy and Dawn hang out in Dawn's barn is one of my favorites in the entire series. And being able to depict Claudia's relationship with Mimi was really touching -- I drew a lot of inspiration from my own relationship with my grandmother, who also had a series of strokes in her later years. And of course, Claudia's relationship with her sister draws a few parallels with my own book, Sisters. I enjoy connecting dots between art and life, and the BSC series is no exception. Book 4 also has a really cool how-to that we created to show my working method and how I create my graphic novels! Thanks again to the incredible people who helped make these books possible. David Saylor, David Levithan, Janna Morishima, Sheila Keenan, and Cassandra Pelham held the editorial reins; everyone else at Scholastic; John Green, my fabulous letterer; Braden Lamb, who brought the books to glorious new life in full color; all of my friends who lent a hand of support or assistance during the four years these books were in production. And of course...Ann M. Martin herself, without whom these books would not exist. I am so happy to say that Ann became a friend over the years we worked together, and I'm always grateful for a chance to talk with her and read her books. She's been an inspiration to me since I was nine years old, and she continues to inspire me to this day. Order a copy of Claudia and Mean Janine now! GHOSTS Cover Reveal & 23-Page Excerpt! Here it is -- the cover of my upcoming graphic novel, GHOSTS! Not only that, but Scholastic released a huge 23-page preview over on Entertainment Weekly, so click away to read part of the first chapter of the book. Enyoy! It'll be in stores in September. Signed Copies of My Books! Upstream is a movement where authors partner with local independent bookstores, to encourage readers to support small businesses. Green Apple has been a San Francisco institution for decades, and it's just the sort of quirky, welcoming, community-oriented place an author like me wants to work with. They've been good to me over the years, and have hosted me for several great events, and I am happy to continue this relationship.